I have to admit that when I saw the code word at CASology I was really tickled by it... it's the sort of thing that appeals to me enormously! Here is a silly card, I'm not sure where I got the sentiment from but it was computer generated! The wonderful duck is from Penny Black and is a firm favourite of mine. What a great expression on his/her face! It's simply coloured with a few Mirage pens, die cut and popped onto a few dimensional pads. Oh Chrissie I love your take on the cue this week! I think a lot of us can relate to that sentiment! And yes... that face says it all! Well hello there cutie - who says you are silly? I think you are simply grand! This is perfect! Love the look on th educk's face and the sentiment is so fun. 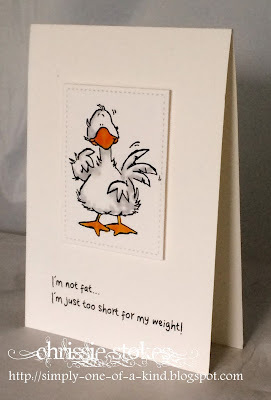 I love all your bird stamps...and the sentiment is perfect for this one...just look at that face! Ha! I know exactly how he feels! Thanks so much for joining us at CASology this week! That's hilarious, and just a bit too close to home! Absolutely love it! I can see why he's a firm favourite - that expression on his face is priceless! 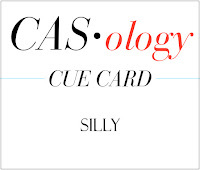 Thanks so much for joining us at CASology this week, Chrissie!